Nothing has more retarded the advancement of learning than the disposition of vulgar minds to ridicule and vilify what they cannot comprehend. Tears are often to be found where there is little sorrow, and the deepest sorrow without any tears. It is much easier not to write like a man than to write like a woman. Wit will never make a man rich, but there are places where riches will always make a wit. 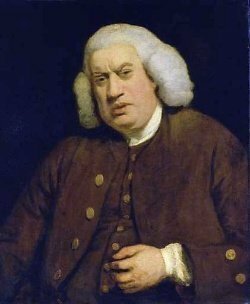 Bio: Samuel Johnson, often referred to as Dr Johnson, was an English writer who made lasting contributions to English literature as a poet, essayist, moralist, literary critic, biographer, editor and lexicographer.